The Tank-Bred Yellowstripe Maroon Clownfish is similar to the Maroon Clownfish except it has yellow stripes on the forehead, midsection, and tail, instead of white. They are strikingly beautiful, with the trademark spine on their cheeks. 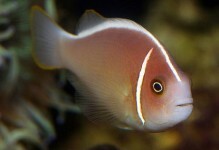 As juveniles, the tank-bred Yellowstripe Maroon Clowns will have white stripes that will gradually turn yellow as they mature. 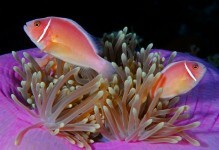 A 30 gallon or larger aquarium is desirable as is a host anemone such as Bubbletip Sea Anemone (Entacmaea quadricolor). They may spit gravel at human visitors in an attempt to intimidate. Tank-Bred Yellowstripe Maroon clownfish are very hardy and durable fish making them a perfect addition for the novice or seasoned aquarist. 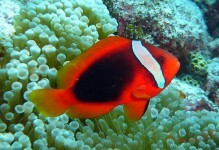 The Tank-Bred Yellowstripe Maroon Clownfish is a good candidate for a reef aquarium. 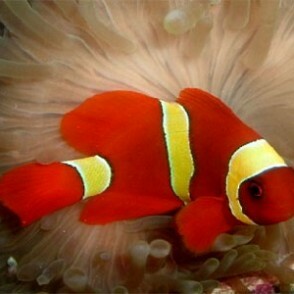 If introduced to the aquarium at the same time, many varieties of tank bred clowns can be maintained together in the aquarium. Tank-Bred Maroon Clownfish are very sensitive to elevated levels of copper, and should never be exposed to levels near or above .15. 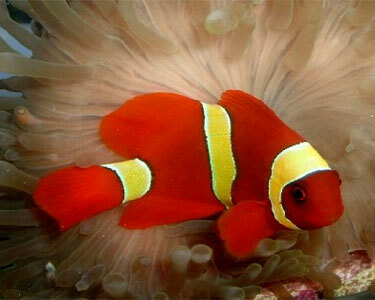 Tank-bred clownfish are easy to breed in the home aquarium. The females will be the largest of the pair, and two fish will usually stay close to each other in the aquarium. These fish are egg layers and will deposit the eggs on a flat surface, and defend the eggs from other tank mates. The eggs will normally hatch in 6-11 days depending on the temperature. The fry must be reared in a separate aquarium on a diet of rotifers then baby brine shrimp. 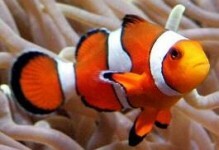 The Tank-Bred Yellowstripe Maroon Clownfish diet should consist of a variety of meaty food items such as chopped shrimp and frozen herbivore preparations.